Pádraig Harrington congratulates Craig Lee on his sensational third round 61 in Crans. Picture: Eoin Clarke www.golffile.iePadraig Harrington had a front row seat as Scotland’s Craig Lee missed out on carding the lowest round in European Tour history. As Lee threated to shoot the first 59 ever seen on the main circuit, eventually posting a 10 under 61, the Dubliner dropped three shots in his last three holes for a 72 that left him 10 shots off the pace and back in joint 17th. Lee started his third round with six consecutive birdies then and adding two more before reaching the turn in eight under 28, with his only par on the front nine coming on the seventh hole. 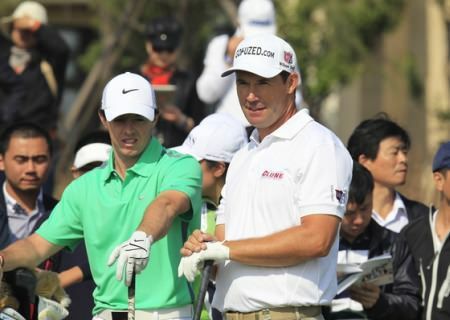 “I’d love to see a 59,” Harrington told Sky Sports commentator Howard Clark. When he picked up a further shot on the tenth, he was firmly on course to card the first sub-60 round in the history of The European Tour, but after a par on the 11th hole, a bogey on the 12th momentarily halted his charge towards the magical 59. He responded with back-to-back birdies on the 13th and 14th holes, taking his tally for the round to 11, meaning he only needed to pick up two more shots from his remaining four holes to create history, with the European Tour record 12 birdies in a round also on the cards. However, he could not take advantage of the par five 15th hole and three more pars followed, as he eventually signed for a career-best round of 61, some ten shots lower than his opening effort on Thursday. By the end of his charge up the leaderboard, Lee had moved to 16 under par 197 and had opened up a two stroke lead over 2011 champion Thomas Björn of Denmark (67), Spaniard Alejandro Cañizares (65) and Frenchman Victor Dubuisson, who share second place on 14 under par. “It was comfortably my best round ever,” said Lee. “Even as an amateur or in a bounce game, I’ve never managed to get to double figures. “So this is my best round by far. You just try to focus on each shot you play though. When you hit it, and it is executed properly and you see it flying down the pin, it is pretty special. He added: “I would like to have had a heart rate monitor on. From the first, I don’t think my heart got under 100bpm. 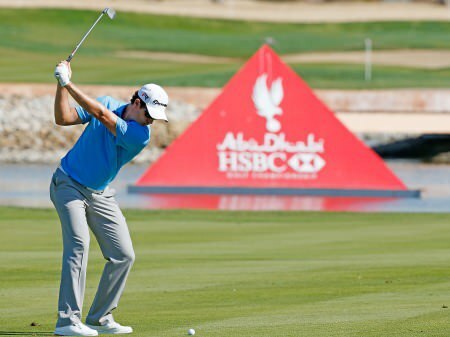 Lee, who started the week in 108th position on The Race to Dubai, admitted that thoughts of a 59 crept into his mind on the back-nine, but the 36 year old’s attention will now be focused on trying to win a maiden European Tour title. 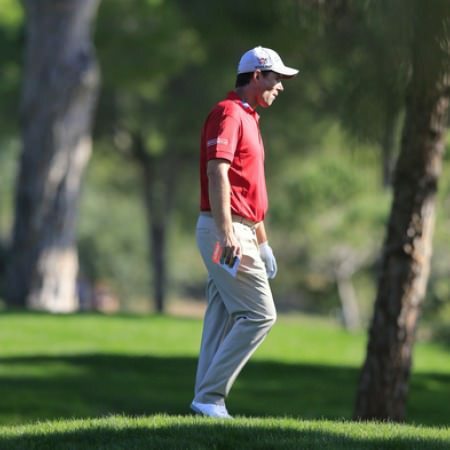 Boosted by a 65 on Friday, Harrington started with a birdie four at the first for the third day running and followed a bogey at the seventh with a birdie two at the eighth to turn for home in 35. HE then holed a bunker shot for a birdie at the 10th but played his last six holes in three over par. After coming back from a bogey at the 13th with a birdie at the par-five 15th, he double bogeyed the short 16th (that hole has cost him four shots this week) and bogeyed the 17th. Gareth Maybin shot a one under 70 to share 32nd on four under but Michael Hoey had a day to forget, carding a four over 75 to slide to joint 60th on two over. As for the leaders, Dubuisson eagled both the seventh and 15th holes en route to his round of 66, but bogeyed the last, while Cañizares had five birdies and an eagle on the 14th hole in his 65. Björn’s round might not have been quite as spectacular, but the Dane knows how to win around Crans-sur-Sierre following his victory two years ago, and his experience could prove vital. “It was a very controlled round to be honest,” he said. “It I just tried to stay out of trouble and take a few chances here and there. I succeeded pretty well in that. It was a solid round and I never got ahead of myself. I knew there were always going to be opportunities and I’m happy with the day’s work. Another former champion, Spaniard Miguel Angel Jiménez (69), is five shots off the pace on 11 under par in a share of fifth position with Englishman Tommy Fleetwood (69), winner of the Johnnie Walker Championship at Gleneagles a fortnight ago.